QUAKERTOWN, PA – (April 24th, 2018) –The North American Deck and Railing Association declared May as Deck Safety Month®. 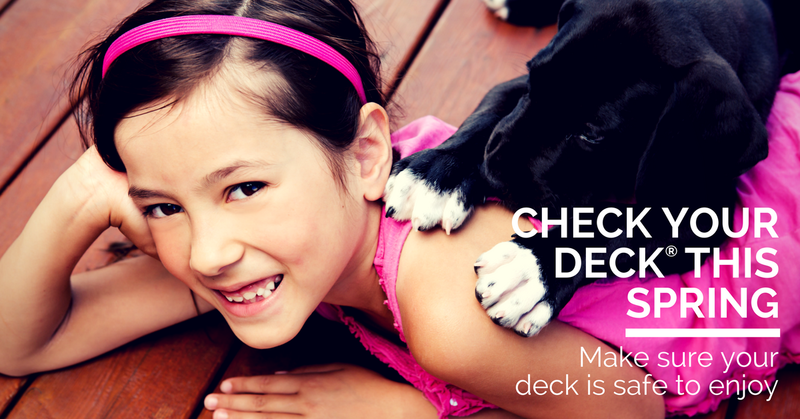 Each year, NADRA raises awareness about the importance of checking your deck through a national deck safety campaign. NADRA’s Deck Safety Campaign creates an opportunity to: Educate. Inspect. Correct; ultimately, helping to prevent injuries and bringing an awareness to the importance of regular deck inspections. Just like other products exposed to the environment, over time your deck will need to be replaced. Asphalt shingles have a life expectancy of about 20 years*. Aluminum and vinyl windows are expected to last 15-20 years*. Beaudry continues… “With more than 50 million decks in the U.S., it is estimated that 25 million decks are past their useful life and need to be replaced or repaired.” It’s important for homeowners to check their deck on a yearly basis. Educate: NADRA has created campaigns and educational programs, along with certifications for home inspectors, deck builders, remodelers, builders, code officials, engineers, architects, distributors, lumberyards and manufacturers to improve proper installation practices. NADRA’s Deck Evaluation/Certification Program has educated hundreds of Home Inspectors to help evaluate unsafe structures. Read more about the class here. Inspect: Homeowners should consider a professional deck inspection. “A professional inspector will thoroughly examine your deck, provide information on your deck’s capacity limits, identify any dangerous problem areas and give you a map of what to keep your eye on in the future,” says Beaudry. Older decks require closer scrutiny and regular inspections. Many decks were built before code requirements were established to protect consumers. Some of these older decks may have deck-to-house attachments using only nails instead of the current recommended construction using deck tension hardware that greatly helps in the prevention of ledger failures. Deck inspection requires special knowledge, expertise and experience. NADRA is working diligently with ASHI, The American Society of Home Inspectors, as well as, AIBD, The American Institute of Building Design. The associations are working towards educating and certifying thousands of industry professionals to meet the need for inspecting the millions of decks that are past their useful life. Homeowners can search for qualified inspectors at www.NADRA.org. Correct: Through the evaluation and inspection of your deck, repairs and/ or replacement should be addressed. NADRA deck builders adhere to a strict code of ethics and are required to submit proof of licensing and insurance as required by their state. Homeowners can search for qualified deck builders at www.NADRA.org. *Source: National Association of HomeBuilders/Bank of America Home Equity, Study of Life Expectancy of Home Components 2/07. Company Name: Woodland Deck Co.
What inspired you to join NADRA? To network and learn from other builders. As deck builders we run into a lot of the same challenges, and learning from each other helps us think outside the box. When did you first get involved with this industry? 25 years ago. What was the first thing you ever built? A fort in the woods. I grew up close to a forest and we spent a lot of time in there. Exploring around and building things was something that held me captive for hours at time. Kids stuff, pretending you are on the run and have to build a shelter… and whatever else we could think up. We want to get to know you, please tell us a little about your business: Woodland Deck Co. was established in 2000. So this is now our 18th year in business. It has been a blast but also very challenging. We specialize in low-maintenance decks and don’t venture too far from there. Pergolas, and deck lighting as well. What advice would you like to share with fellow members that you have learned in your career? Don’t eat yellow snow! jk. On a more serious note: You can always make more money, you can never make more time. If you could ask your fellow industry professionals one question, what might it be? How will the way we do business change in the next 10 years? What would you do for a career if you weren’t doing this? A non-for-profit business coach. I would like to serve people in deprived countries and help them find a way to build sustainable business for their families. A little more about Steve: I’m a father of 8 kids, and enjoy doing most things outdoors with them. This seems to take up most of my free time. We recently did a RV cross-country trip which was a blast. I’m hoping to do another trip, maybe next year? What inspired you to join NADRA? I’ve been building decks for over 40 years. I wanted to become part of an organization that dedicated itself to MY profession. When did you first get involved with this industry? On a full time exclusive basis- 35 years ago. What was the first thing you ever built? I helped my father (who was a builder/remodeler) build a two level deck on a lake home when I was 14 (53 years ago). We are a TREX-Pro-Platinum contractor. BBB – A+ rated. We don’t have crews….we are the crew. Fully licensed & insured. Community oriented – contributed labor to several “Habitat for Humanity” homes through the Home Builders of Western Michigan and have built several ramps for veterans. How do you define success? Success can be defined in several ways: 1) If you love what you do; 2) If you love who you work with: 3) If your customers become your friends and you satisfy them beyond their expectations; 4) If you have been able to weather the economic instability over the past 20 years; 5) If you are recognized by your peers in the industry that you work in. What advice would you like to share with fellow members that you have learned in your career? Be open to listen to others – you can learn something new every day if you are just willing to listen. Also, be humble – don’t be the “know everything” person in the room…. because you don’t. Always be open to sharing ideas. What would you do for a career if you weren’t doing this? Cooking is my hobby. I love to cook (My wife is a great cook, but I do 90% of the cooking in our home). I would have a small specialty eatery/café offering specialty salads and sandwiches (made to order right in front of the customer) and unique soups. A little more about Barry: My family is the most important aspect of my life! I used to be a “workaholic” back in the late 70’s / early 80’s. After my mother passed away and my children were growing, I decided that I needed to focus my energy on them and not on just chasing the money. I would rather have my wife and children see me as a role model that they can look up to than an “absentee” dad that was never home because of work and chasing the almighty dollar. At a time when most people my age are retired (I’m on Social Security), I am out in the field every day with my best friends (my daughter and my son) working side-by-side doing what I love. My wife and I have been together for 46 years and enjoy spending time together in our first (and only) home. We love spending time outdoors (why not? I work there) enjoying our kids and grandchildren around the pool…..life couldn’t get any better!!! We want to get to know you, please tell us a little about your business: Diamond Decks has been operating as a deck builder for 24 years now. In 2008 we decided to make a change in the way the business is structured, and decided to narrow our focus to just Decks, Screened Porches, and some patios. We are constantly refining our best practices to give our customers the best deck they can have. In 2016, Diamond Decks was in the top 25 contractors in the nation, for sales of Fiberon Decking. We were actually #14 in the nation. We earned an all inclusive paid vacation to St Thomas along with the other top contractors, from Fiberon and the trip was awesome. It was nice feeling, to be recognized by a leading deck board manufacturer. 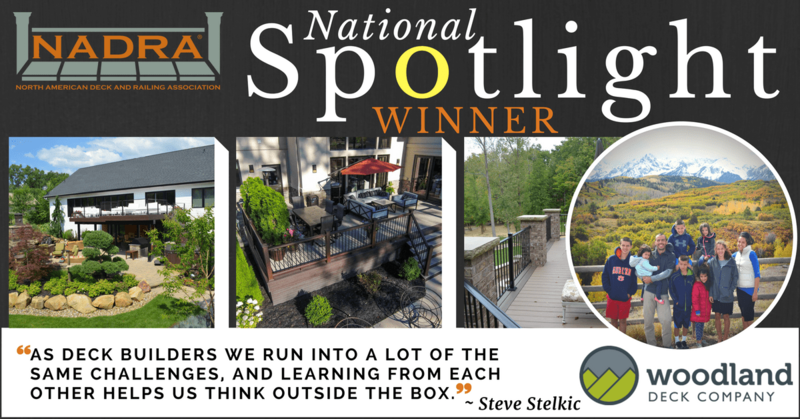 We were also one of the first deck builders to earn the “Master Deck Professional” certification through NADRA, and sent our field supervisor Dave Ross, through the class at the deck expo, to become certified. How do you define success? Success does not necessarily have anything to do with your volume of sales, and the money you make. I believe it has more to do with being able to put together a solid team of people who work together to help other people out, and also being looked up to as someone they can count on to give them the honest truth. What advice would you like to share with fellow members that you have learned in your career? You get more out of business, when you stop chasing that dollar, and do something that you are passionate about. The money will come. What would you do for a career if you weren’t doing this? Probably a building inspector? or do some kind of deck design consulting, if there is a thing like that? or maybe a rock and roll star! A little more about Bill: Hobbies…….. If I am not working on something that has to do with business, which I actually like to do, I would be doing something with music. I play in a band, and if I am not playing somewhere, I am going to support my friends in a number of other bands, and sometimes sit in with them for a few songs. You can see the music theme……. My wife also goes to all my shows, and supports me in everything I do. We have two kids 29 & 25. Our son, the oldest is an IT guy and is awesome at doing that, and our daughter is now a practicing Doctor of physical therapy. The good news is, they will both being moving out of the house in the next month. SWEET!!!! NADRA launched a member spotlight award for 2017. We are excited to showcase our first winner of 2017, Robert Lascelle from MyDeck.com. What inspired you to join NADRA? Lainie chased me down for a long time and finally beat me down until I had to attend a meeting. So glad she did! NADRA has helped my business grow and I have lifelong friends within the organization. What was the first thing you ever built? It Was a deck of course, it was a pressure-treated deck in Pittstown, New Jerse y. How do you define success? I define success in business as the joy you feel from your work and also the joy you feel from your clients after a project is complete. What advice would you like to share with fellow members that you have learned in your career? Work on your business and not in it. If you could ask your fellow industry professionals one question, what might it be? What single action have you done that has brought you the most success? What would you do for a career if you weren’t doing this? I would be a Sandyhook Harbor Pilot. I would have been one if I had not started my business at such an early age. Tell us anything! Talk about your family, pets, travel, hobbies… I have an incredibly beautiful wife that has many skill sets including being a wonderful mother to my daughter Brooklyn and my stepson Cory. Brooklyn is 10 years old and enjoys gymnastics and animals. Cory just turned 18 and is heading into the Marines July 10, 2017. My wife is a heavy equipment operator as her main job, she also performs autopsies at Hunterdon Medical Center. Lastly, she became a Hunterdon County death investigator last year. I spend most of my time running my business and trying to be as good of a dad as I can to my children. I love being on the water and have two Jetski’s and purchased the boat of my dreams last year. I plan on taking the entire month of July off this summer to spend a lot of quality time on it with my family. *A Member Spotlight winner will be chosen each month. For a chance to win, please fill out the questionnaire found here.